You tried installing passbolt on CentOS but things didn’t go as planned ? You are struggling with some parts ? Or you simply want to learn how to have a running instance of passbolt ? Then this step by step tutorial is for you. It covers the installation of passbolt on a freshly installed CentOS 7 environment. 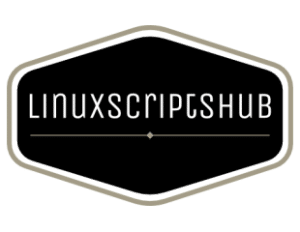 You can get CentOS 7 by downloading it from the official mirrors, by running the corresponding AMI for AWS, or by pulling the CentOS docker container. The goal of this tutorial is not to create an hardened installation, but more to create a minimal barebone passbolt instance you can use to test the application locally, before you start building your production environment. Before we start, I’d like to point out that SvennD had already made a great tutorial about it. However since then, a few installation steps have evolved and we got to know about a few additional pain points faced by the community while installing passbolt on CentOS, hence this updated version was born. 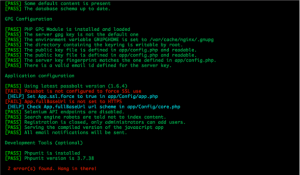 php-devel, gcc and gpgme-devel are required to build php-gnupg extension throuhg PECL. policycoreutils-python will install some binaries to easily manage selinux policies such as semanage. Entropy is required to generate the SSL or GPG keys. Since it can be long to generate entropy (e.g. randomness) on virtual machines we will install rng-tools to ensure that there is enough. Security note: rng-tools is not magic, as it can only get entropy from the sources available. In other words if your virtual machine has no available sources of entropy then security-wise it will not help. You can check how much entropy is available at any given time, the higher the better. Learn more. Create a database called ‘passbolt’ for Passbolt to operate with. It’s not mandatory but recommended to run the following command to secure initial mariadb installations. We will use it in this tutorial to set the root credentials for the mariadb instance. Check the official mariadb documentation to learn more. # mysql -u root -p -e "GRANT ALL ON passbolt. * to passbolt@'localhost' identified by 'YOUR_SECRET_PASSWORD_OF_CHOICE';"
Note the user will be only allowed to connect to the database through localhost. If plan to install mariadb on a remote node this value might change. Now that we have all the required dependencies and packages installed, let’s start configuring passbolt and its dependencies. Important: Currently php-gnupg does not support keys with a passphrase so you will need to leave that field empty. Passbolt will need its own PGP key to be able to shake hands with the users during the authentication procedure. Use the command below to generate a PGP key pair, and answer the questions. It’s a good idea to fill in the details properly and not press enter frantically. Make sure you have decent name and email for the key. This will come in handy to identify and verify it down the line. We’ll need to export the public and the private key that we created previously. We’ll store the keys in the configuration folder. Don’t forget to replace email@yourkey.com with the email address you used while generating your key. The web server needs to be able to write in the tmp directory to speed things up during excecution. It also need a place to upload the profile pictures. 5.1. Let’s copy the default configuration files to create our own versions. We need to edit the security salt, cipherSeed (digit only), and fullBaseUrl (the url where passbolt will be reachable) in core.php. Both values are currently not used, but they may be used in the future, so it is a mandatory step. Choose random values by for example throwing a few dice. The lines below will have to be modified. We also want to uncomment and change the App.fullBaseUrl to our selected domain or ip address so that all the links are correctly formatted. This will be used for example to display the avatar images in the notification emails. Do not forget to uncomment the line. It is commented by default! 5.3. We also need to set the right database name and user credentials in database.php. You need to fill in the details for your default database server. Here mostly login (e.g. root or whatever user you have created previously), password and database (passbolt). We need to tell the application to use reuse our freshly created gpg keys, as the default ones are insecure. To accomplish this we set the fingerprint and location in app.php (in the GPG Configuration section). Also take a moment to check the other application settings. You may want to allow public registration of users for example. To obtain the fingerprint of your key, you can run the command below. Everything is now ready. We can install passbolt. You can at that step decide if you want to send anonymous statistics about your passbolt usage. Cool kids do, because it helps the developers to make passbolt better for everyone. Passbolt is installed. We now need to tell nginx how to run it. 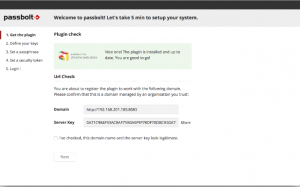 Among other settings, passbolt needs to be run by a web server configured with url rewriting. #  disable content-type sniffing on some browsers. 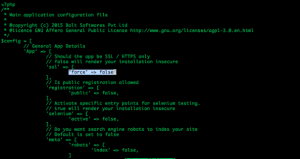 We’ll also set App.ssl.force parameter to false in the app.php configuration file, so that we can test that passbolt is already in a working condition. If we keep it to true, passbolt would not let us access it through http and would force https. In our installation, everything seems now in order, except the SSL part which we are going to fix. If you are impatient to see passbolt in action, continue with the next step: create a first user. Or if you want to complete everything first, then you can jump directly to the emails section. At last, passbolt is up and running! But there is no user yer. So let’s create our first user, the administrator. Follow the link in the terminal to start the setup process, in the browser, for this admin user. Once logged in, we can start creating passwords. Don’t forget to take a backup of your key during the setup. Before inviting other users we need to wrap-up the email configuration in app/Config/email.php. Enter the host, username and password of your SMTP server in the default configuration. We also need a cron job to send periodically the emails from the queue. It is recommended to use https with passbolt (and, well, pretty much everything). To setup SSL we need a certificate. Here for the sake of brevity we will create a self-signed certificate. Of course you are free to use a proper free certificate and tidy up the server supported cypher suites. In the following steps, we’ll generate a self signed certificate and configure nginx and passbolt to use https. That’s it! Passbolt is now ready to be used with https. 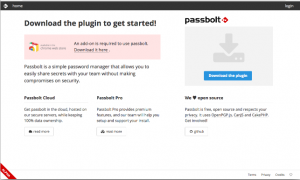 You will notice that the passbolt plugin tells you that the plugin is not configured to work with this domain. This is normal since it was already configured to work with http, and not https. 5. Sign the certificate yourself (rather than via a known Certificate Authority). 3. Open it and select "Always trust"
Restart php-fpm and nginx to take effect.